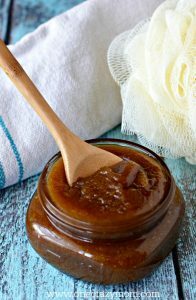 DIY Body Scrub - Brown Sugar Exfoliating Body Scrub that is so easy! You are going to love this DIY body scrub. It smells so good and it feels even better on your skin. 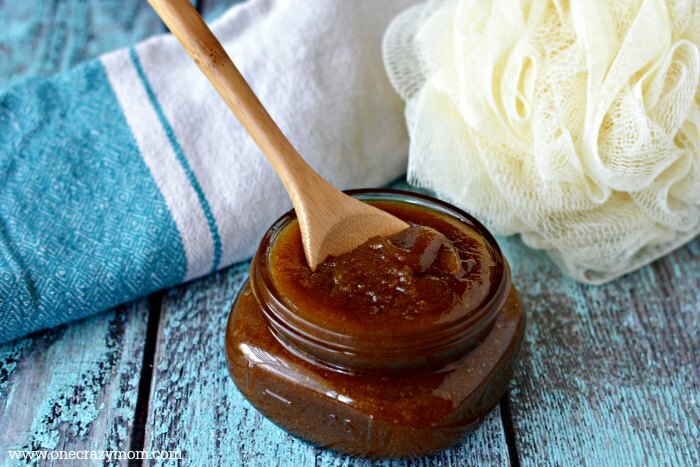 Brown Sugar DIY Body Scrub leaves your skin moisturized and so soft. I love body scrubs but they are so expensive in the store. I’m not sure why those little bottles cost so much! 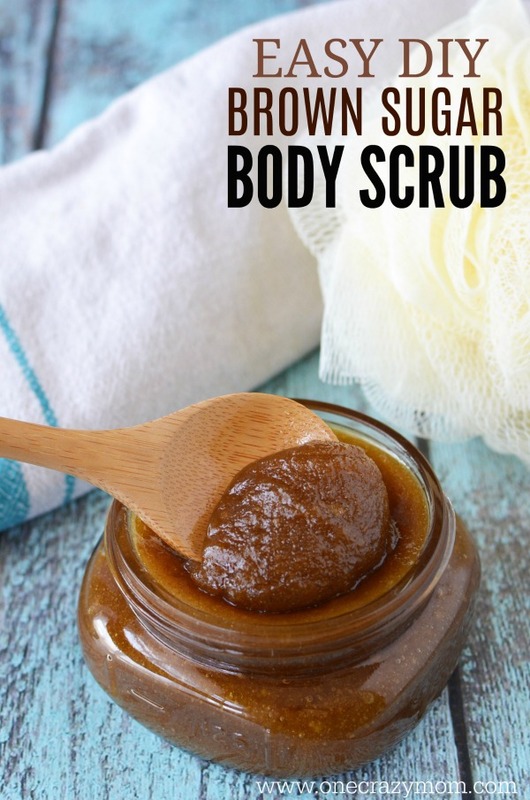 You can make a ton of this brown sugar exfoliating body scrub for a fraction of the cost of buying it. You might want to make a double batch to hand out to your friends for hostess gifts, birthdays or Christmas. There is a restaurant we love and they have the most divine body scrub by the sink to use on your hands. This reminds me of it and I really think you will love it! 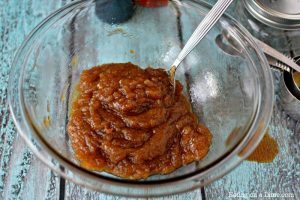 This is the best brown sugar scrub recipe! I purchase my jars at Amazon. They have good prices and it saves me a trip to the store. I was really surprised at all the choices. Normally I buy a large pack so that I can have them on hand when I want to make another batch. You are going to love this DIY Body Scrub Brown Sugar tutorial! It’s wonderful all year round but especially in the cooler months when skin starts to get so dry. You will wonder why you didn’t make this sooner. It’s very simple to make and does not cost a fortune! Let’s make DIY Exfoliating Body Scrub! Mix all ingredients together and place into a glass jar. It is really that simple to make this Body Scrub DIY! Wet skin before scrubbing onto body. Dry skin will be a thing of the past when you start using this luxurious brown sugar scrub. It works wonders on dry skin! You can also make Brown Sugar Body Scrub with coconut oil. If you prefer, use coconut oil instead of olive oil to make this recipe. We equally love this sugar scrub recipe coconut oil version just as much as the sugar scrub recipe olive oil version. How do you make a brown sugar face scrub? We also love brown sugar face scrub. You can combine oatmeal and brown sugar to make a luxurious Brown Sugar Face Scrub. 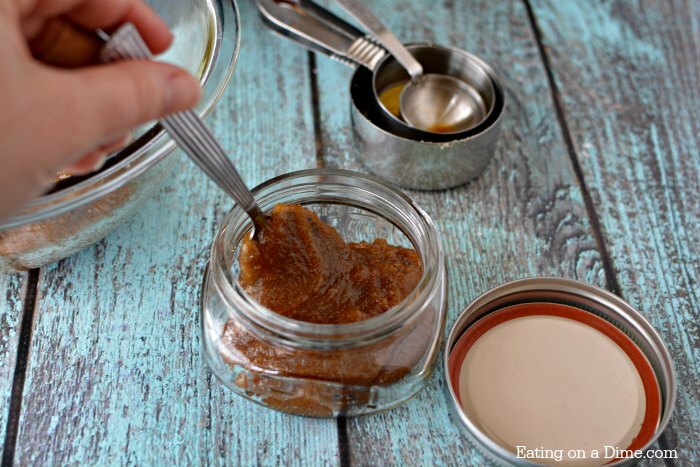 Homemade Brown Sugar Body Scrub Honey DIY is so decadent and I’m excited for you to try it! Let us know what you think when you make it. You will feel so pampered. 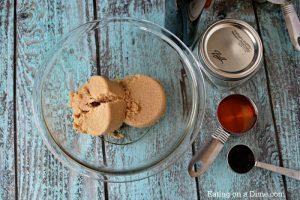 Make a double batch of this brown sugar exfoliating body scrub because your friends will love it too! This scrub is the perfect gift for friends and they are sure to love it. Attach a few gift tags and you are set. Skin care is so important and a sugar scrub or salt scrub will slough dead skin cells leaving your skin smooth. Try other natural ingredients such as sweet almond, green tea, sea salt and essential oils. We love trying new ideas and we have several sugar scrubs we love. They make skin so soft and dry skin will be a thing of the past. Skin feels amazing after a sugar body scrub. The brown sugar scrub is always a hit for gifts. We also love making this Easy Homemade Peppermint Sugar Scrub That Smells Amazing around Christmas. 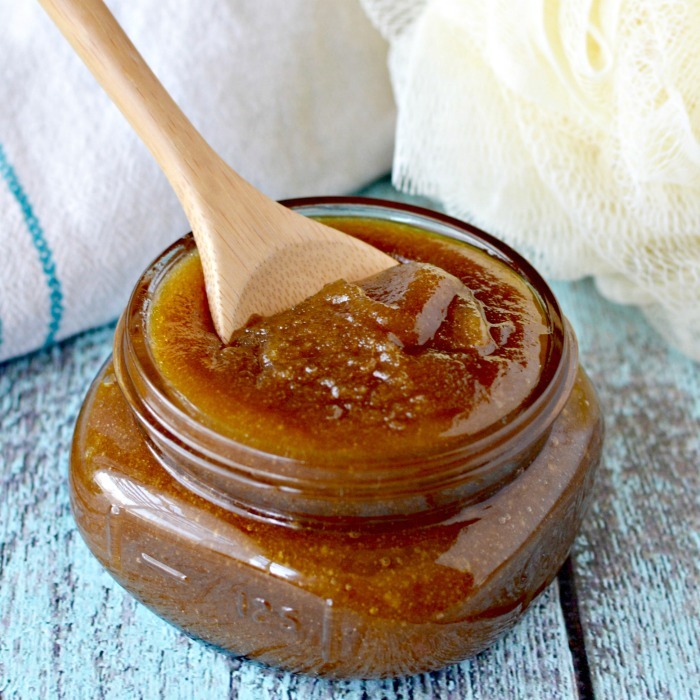 We love making natural products and this Brown Sugar DIY Body Scrub does not disappoint! It feels so good to have these products on hand to give your family. You will love making your own natural products to use like this DIY Body Scrub. Let us know how it goes for you. You will love using all these great natural products and have fun making them too!